Ron Kordes, 2012 AVCA National High School Coach of the Year, runs his state champion high school team through 14 team drills. 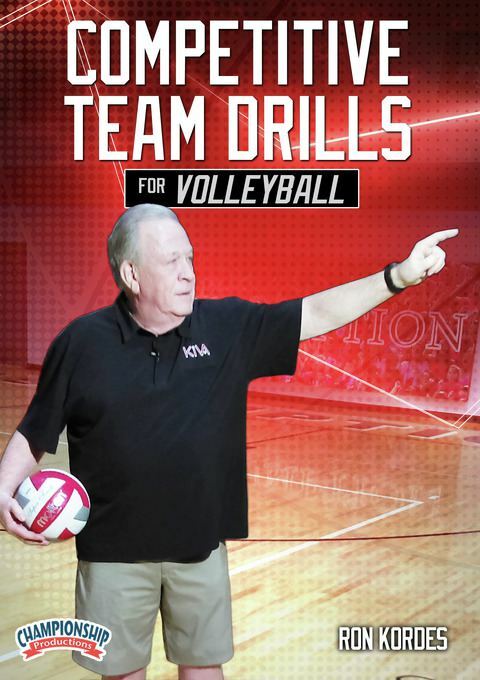 He provides insight into ways to customize the drills to meet your team’s skill level while building a stronger and more cohesive unit. You can use these drills to focus on player movement without the ball, such as block coverage and out-of-system sets. Much of the time in these drills is spent attacking offensively in a 6 on 6 situation. Here, you’ll be able to learn drills that help with out-of-system play. Your players are held accountable on getting a terminating swing while out-of-system. The Initiator/Terminator Drill puts focus on certain hitters and getting them to score more. You can tailor the drill to target the athlete you feel needs the most work. Finishing a set or game – Successful teams need to be able to finish games when they get into the 20s. Strategies are discussed for the end of a set situation and drills focus on putting pressure on players to limit unforced errors. Side-out offense – In order to win regularly, teams need to be successful scoring on first opportunities. Battling back from a deficit – Coaches can’t expect players to have the mindset to battle back from a deficit without giving them the experience in practice. The competitive nature of the Reverse Make It Take It and 5 Sets to 25 drills helps replicate the feeling of needing to get back into the game on the scoreboard.